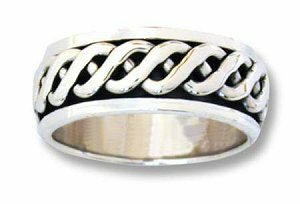 Home > Wholesale Silver Jewelry > Rings > Celtic braid spinner ring. Braid design spinner ring. Inner portion spins within outer portion. Weighs approx. 9.5 grams. Order by US size range.